In the Edit palette, you can undo and redo recent changes. You can also see how many undos are available. Undo the last model action. The Undo button also shows you how many Undos are available. If the model has subtools then each subtool has its own Undos. Press the Redo button to repeat an undone action. This button is only active if Undo has been pressed, and no other actions have been performed. The Redo button also shows you how many Redos are available. 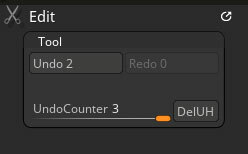 If the model has subtools then each subtool has its own Redos. The Undo Counter slider allows you to navigate through the current model undo history, as an alternative to the Undo or Redo buttons. The Delete Undo History button will delete the whole undo history for the current model. If the model has subtools then only the selected subtool’s Undos will be deleted.